In an analysis of more than 85 studies, apple consumption was shown to be consistently associated with a reduced risk of heart disease, cancer, asthma and type 2 diabetes, compared to other fruits. In one of the studies, Finnish researchers followed more than 5,000 men and women for more than 20 years. Those who ate the most apples and other flavonoid rich foods such as onions, were found to have a 20% lower risk of heart disease than those who ate the smallest amount of these foods. 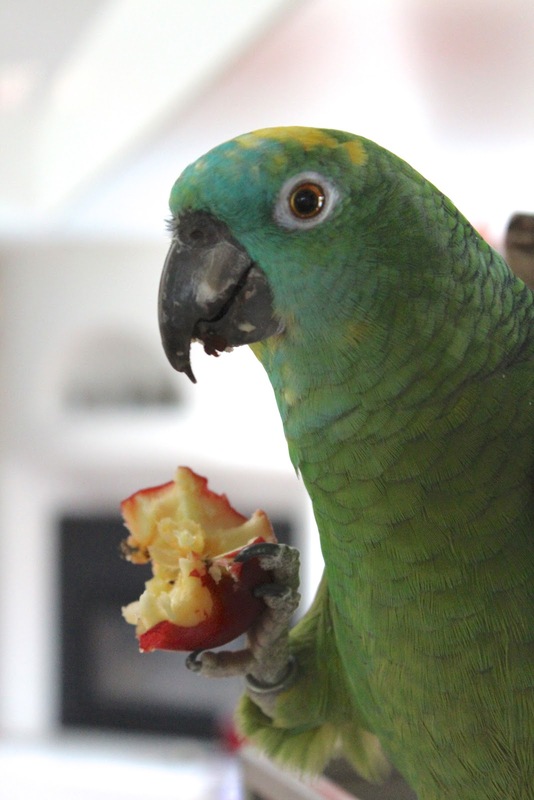 Harold enjoying his "lady" apple! 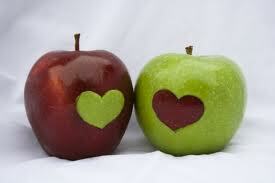 Apples are rich in a soluble fibre known as pectin, which has been shown to exert a number of beneficial effects. Because it is a gel-forming fiber, pectin can lower cholesterol levels as well as improve the intestinal muscle's ability to push waste through the gastrointestinal tract. One medium unpeeled apple contains 3 g of fiber. Even without its peel it contains 2.7g of fiber. Just adding one large apple to the daily diet has been shown to decrease serum cholesterol by 8 - 11 % Two apples a day has been shown to lower your cholesterol by 16%. Apples also contain malic and tartaric acids, which improve digestion and the breakdown of fats - so combining an apple with fattier food like apple sauce with pork, or apple slices with cheese, not only tastes good but helps the body deal with the fat intake. Apples are helpful in the relief of the pain of gout, rheumatism and arthritis - and also help you feel better the morning after too much drinking! An apple on our tree last year was "picked" by one of the tendrils of the grape vines! They are great to eat if you have diarrhea and are one of the 4 components of the BRAT diet used for diarrhea or food poisoning - with BRAT standing for Bananas, Rice, Apples and Toast. Apples are also a good source of Vitamin C and potassium. Most of the apple's important nutrients are contained in its skin - so eating them raw and with their skin is best. They are a wonderful substitute in cooking and baking for oils. In my salad dressings I replace oil with unsweetened organic apple sauce and in my baking, I frequently use applesauce to replace the oil. Not only do I benefit from no oil, but I also benefit from eating the apple! We have several apple trees (- an old proverb says " if you can plant only one tree in your garden, make it an apple tree") and too many to eat when they are all ripe. So I dehydrate them. I often leave the skin on, slice them and don't feel the need to use lemon juice. The idea is that we can then enjoy them year round but this year I think we had eaten them all by Christmas - and we had a lot! Dried apples are a lovely snack....and you can now buy freeze dried apples which have a lovely crunch. Have you had your apple today?